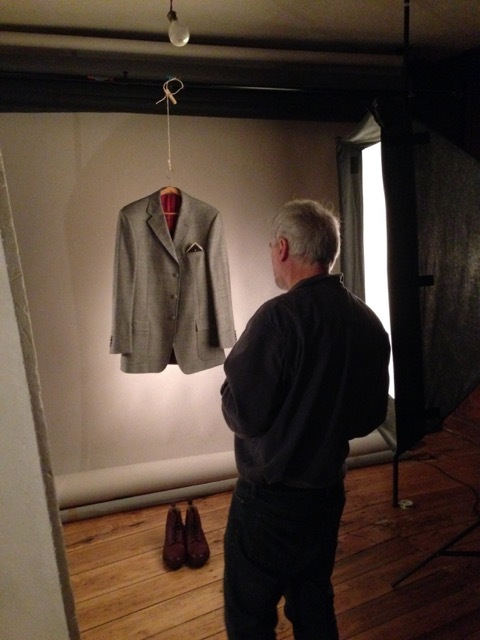 Today we took studio photographs of the outfit. These photos capture the suit in its purest form- unworn, appearing without indicators of environment, person or place. The suit here is new and yet to face trial by sun, ice, rain, dirt, activity and time. I have often thought of it as a character in its own right; with a life and significance of its own that provokes reactions and judgments independent of who is wearing it. Here are some iPhone photos we took to document the day. We will publish the actual shots at a later time. We are lucky to be working with photographer Alain Auzanneau here in Puy L’Eveque. Side note: As we prepared for the photos we needed to find hangers that felt appropriate; no plastic, enough width to hold the suit properly, an implied generosity in their shape etc. I have never in my life paid much attention to a hanger. They are simple objects that don’t really change much over time since their form is based on the fixed shape of the human body. That said, when you pay attention there is an enormous range of aesthetics within these narrow design parameters. We went on a hanger hunt. Our favorite is an old (perhaps 1960’s?) hanger from Czechoslovakia. It will appear in all of the photos.